This project explores the development of an additive manufacturing technique for nonwoven textiles. Nonwoven textiles, based on natural materials, synthetic polymers, or blends of the two, have numerous performative aspects, including excellent acoustic absorption, thermal insulation, and tactile characteristics. Felt is a typical example of a nonwoven material, and can be manufactured by both wet or dry processes. One example of a dry process involves needle felting, whereby fibers of the textile are meshed and entangled when punched together. This process binds the material together seamlessly without the addition of sewn thread or adhesives. Needle felting can range in scale from hand craft techniques with a single needle to large scale web processing. Integration into a robotic process not only enables precision and speed in manufacturing but also extends needle felting as a three-dimensional process, allowing for local differentiation of stiffness and other properties across a homogeneous solid. Through a customized digital workflow, formal and material properties can be varied at local level within a component. By developing a fully integrated design to production methodology for influencing these properties, this research opens a wide range of potentials for nonwoven textiles in architectural applications. 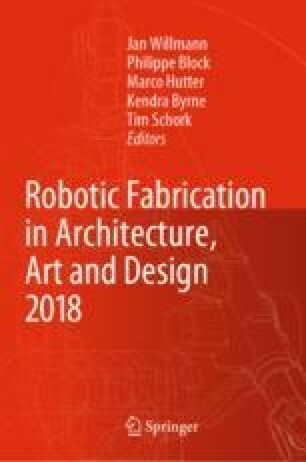 The research involves three areas of development; the process tooling for robotic felting, the digital workflow that enables the formal and material properties to be specified computationally and embedded into the machine code, and prototypes of architectural elements such as acoustic panels and furniture demonstrating different techniques and processes. This work was generously supported by the 2018 Taubman College Research Through Making Programme, as well as the University of Michigan Office of Research. Research Assistant Rachael Henry supported the work and Jared Monce, Drew Bradford, and Carlos Pompeo provided production assistance.